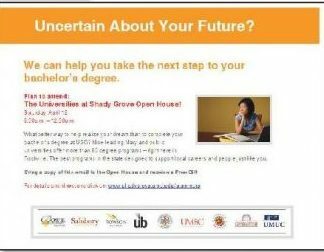 In the Spring of 2008, The Universities at Shady Grove proudly opened its doors to a brand new building on their campus. This building more than doubled their capacity for students. The challenge of this project was that we needed to quickly fill up their classrooms with students. We needed to accomplish this and amortize the costs associated with their new building on their campus. 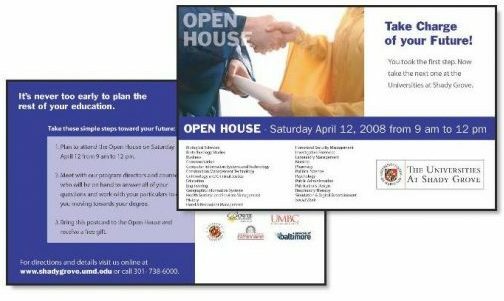 Kinetics MarCom employed an integrated communications program that incorporated TV, print, direct mail and email marketing. 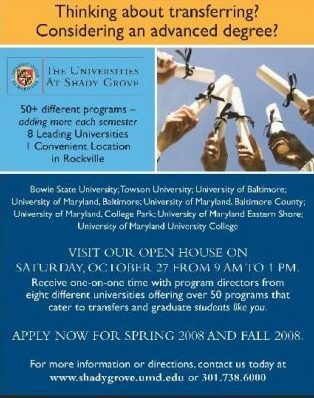 An umbrella theme was developed and carried throughout all media.This campaign was targeted to college-age students in Montgomery County who wanted to pursue a world-class education. We also needed to convey the array of flexible learning options and class times offered to potential students. Our direct mail and email campaigns were driven by extensive data research and proved very successful. After the campaign broke, the open house held in April attracted record crowds compared to their other open house efforts. In two years, the school reached their attendance goals.